it seems more and more folks are learning what I learned many years ( and flights) ago . . . never check luggage! And even carry-on luggage may incur additional fees depending on the airline you’re flying. This all stems from the Airline companies trying to squeeze every last penny and every last drop of efficiency from their passengers and staff. The up-side to this painful extra charge is that airports are reporting faster progress through check-in lines due to passengers bringing fewer bags. I doubt it’s as bad (or interesting) as my above cartoon, but I could see something similar happening occasionally. An airline passenger speaks with a TSA security guard. He's happy he doensn't have carry-on baggage. 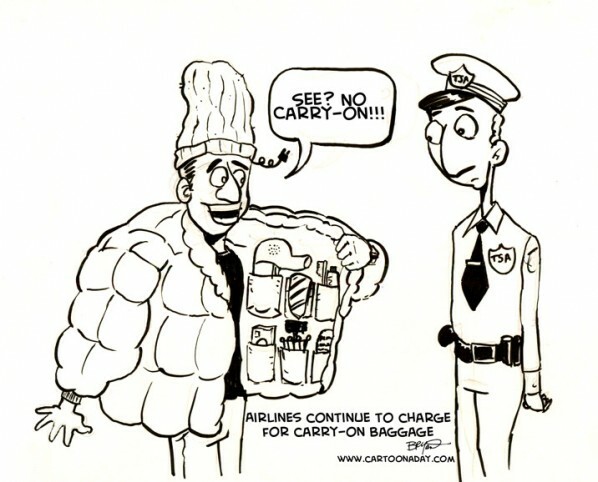 Inspiration: Inspired by recent airline charges for carry-on baggage.